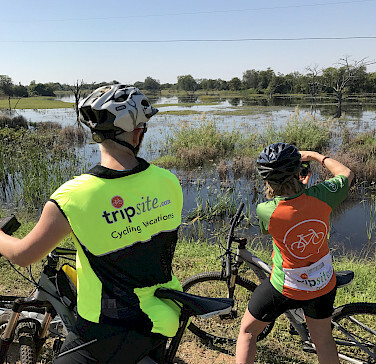 Combining a bike tour in South Africa with a wildlife safari? Have you ever heard of such an experience? Talk about unique! 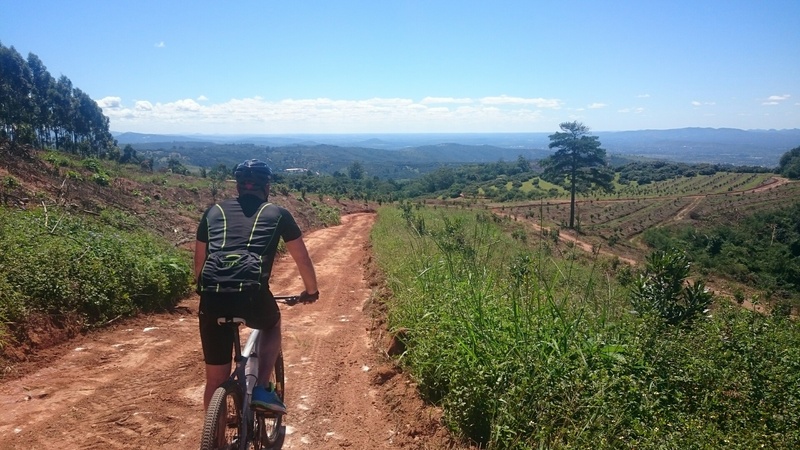 This is a biking and adventure tour in Northeastern South Africa in the Limpopo and Mpumalanga Provinces. 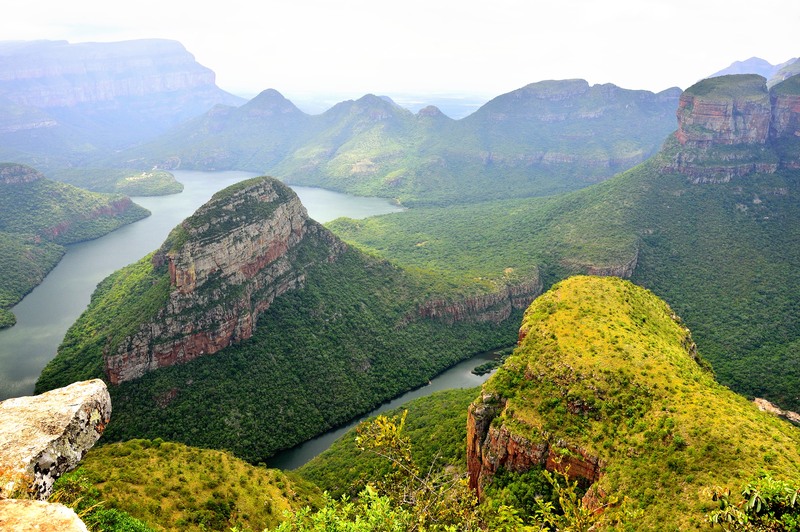 You will visit the fascinating Greater Kruger National Park and the breathtaking Blyde River Canyon with the Three Rondavels, with God's Window and Bourke's Luck Potholes. 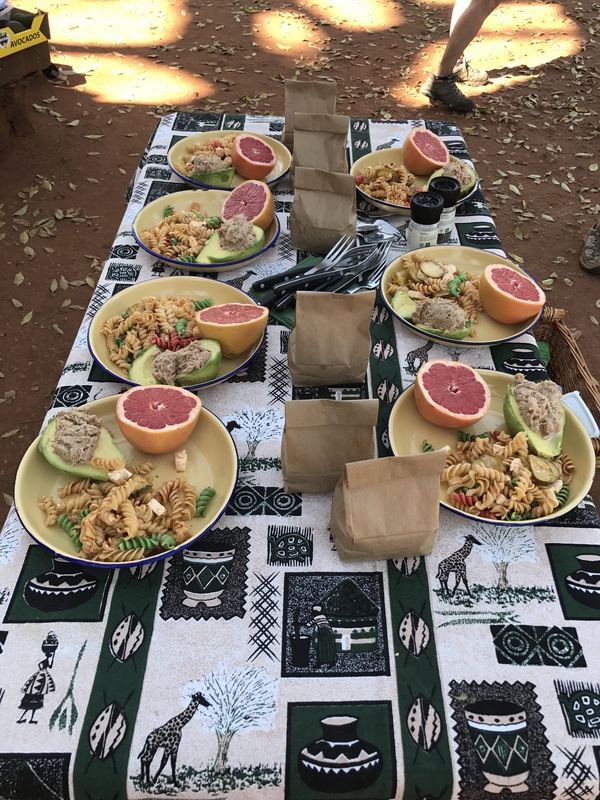 In addition to your safari experience and cycling, you will also have the opportunity to participate in a different activity each day. Featuring stunning panoramas and game drives, as well as hands-on experience in cultural customs and everyday life, this tour has it all. Your incredible adventure will be led by two licensed tour guides and will be accompanied by a support vehicle ensuring reliable luggage transfer and support during the cycling itinerary and guaranteeing a unique, relaxed, and stress-free travel experience. Fly to O.R. Tambo International Airport (JNB) in Johannesburg. Tour start: The tour starts at the O.R. Tambo International Airport (JNB) in Johannesburg. The pick-up time on Sunday (the first day of your tour) will be at 11:00 am at the airport. Please ensure your flight arrives before 10:00 am. If you would like to arrive the day before the tour starts, we can offer you a pre-extension program. Please see the Soweto and Johannesburg Pre-Extension. Our transfer to the start of the tour takes about 4 hours. Tour end: The tour ends at 10:00 on Monday. The flights from Hoedspruit Eastgate Airport (HDS) depart at 12:00, 13:20 and 13:55 depending on your destination. Guests will be transferred to the Hoedspruit Eastgate Airport (HDS) in time for their flights. If you would like to transfer on to Johannesburg by car, a private transfer can be arranged. Please note the transfer takes approx. 6 hours with a stop along the way. 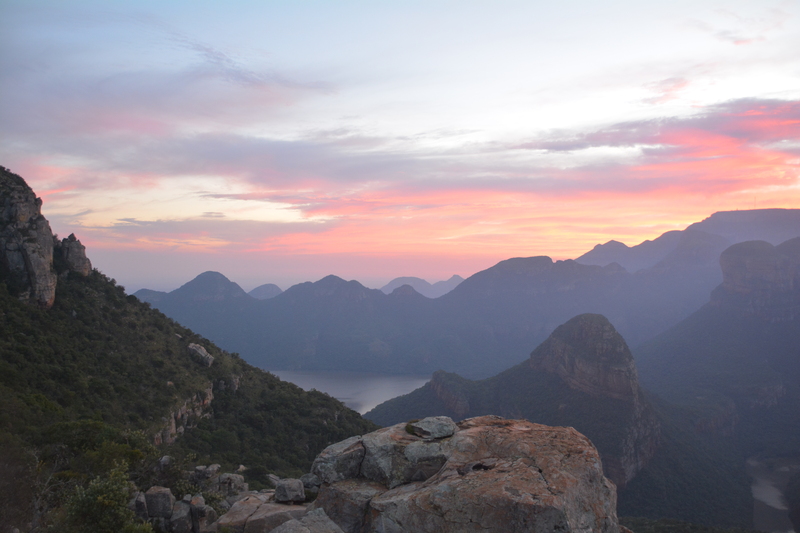 The best months for an adventure in South Africa are the cooler months starting in March and ending in October. South Africa is a subtropical region, moderated by the ocean on two sides and the altitude of the interior plateau. These account for the warm, temperate conditions so typical of South Africa. Please do check local conditions before your arrival. A good website to use to research average high/low temperatures, average rainfall, and other weather related facts is weatherbase.com. Tour dates are officially confirmed or cancelled 10 weeks prior to tour date. The minimum number of guests needed to guarantee a tour is 7. In order to guarantee a tour earlier than 8 weeks, we can do so for bookings of 2 with a supplement of €300 per person. This amount will be refunded as soon as the group reaches a minimum size of 7. Please note if the number of guests are below 4, only one tour guide will accompany the tour. If the number of guests are above 5, a cycling tour guide as well as a tour guide driving the support vehicle will accompany the tour. 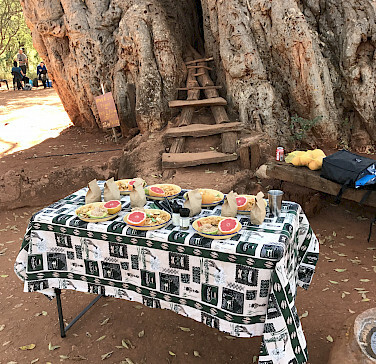 On this tour, an extra activity is offered daily apart from the cycling tour, for example: a visit to citrus packhouse, a bush walk, a game drive, a visit to the Echo Caves, a visit to the Bourke’s Luck Potholes and a visit to Kaross. This is included in the tour price. This is a moderate level guided and fully supported tour with cycling on a combination of off-road, paved, and dirt surfaces. The pace of your daily activities is leisure and require a basic level of fitness and experience on your bike. The bike rides consist of 15 - 30 km per day with an elevation gain of 110 - 470 m.
This tour offers a variety of accommodation throughout the trip to give you a complete feeling of what this area has to offer. The 3-star accommodations range from lodges, to hotels, to chalets, all of which have been chosen to offer you the uttermost comfort after each bike ride. Most inbound flights incur a transfer in Johannesburg (JNB) or Cape Town (CPT) to Hoedspruit Airport (HDS) so it is convenient to spend extra nights in either cities. Transfers are available for a supplement. Welcome to South Africa! Upon arrival you will notice that you are in a country filled with smiles. A guide will meet you at O.R. Tambo International Airport and accompany you to your overnight accommodation at Bandelierkop, near Polokwane, the capital of Limpopo Province. The transfer will depart at 11:00 am from the Airport. Travel time from the Airport to the overnight accommodation is approximately 4 hours. The first 3 nights will be spent at a Private Game Lodge. 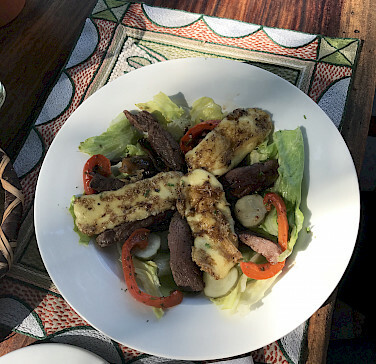 After settling in, you will end your first day in South Africa with a game drive and a cozy dinner in an African boma. 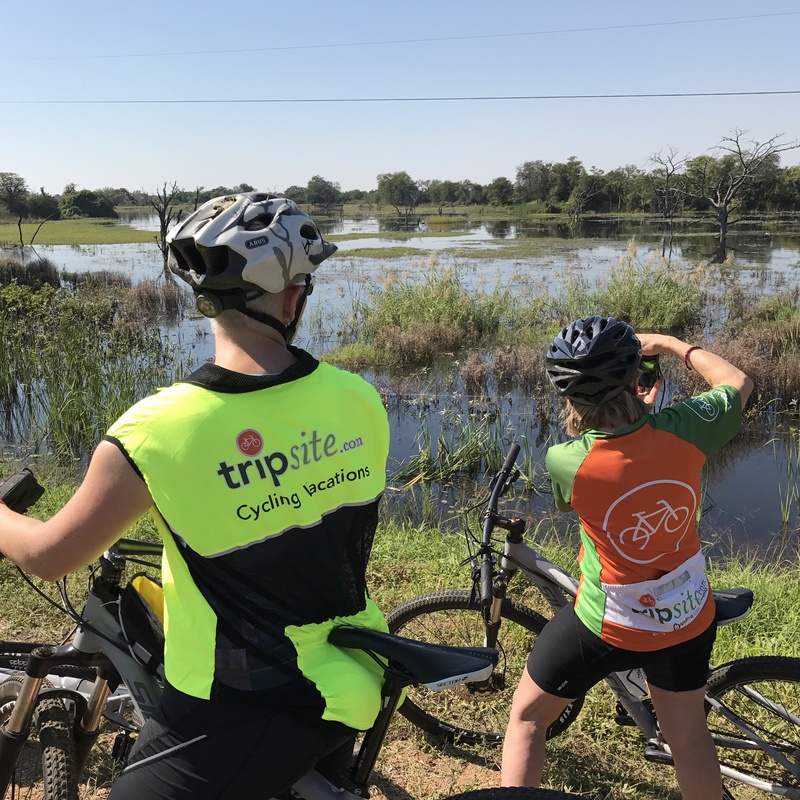 After breakfast, your first bike ride is an exploratory ride through the bushveld. 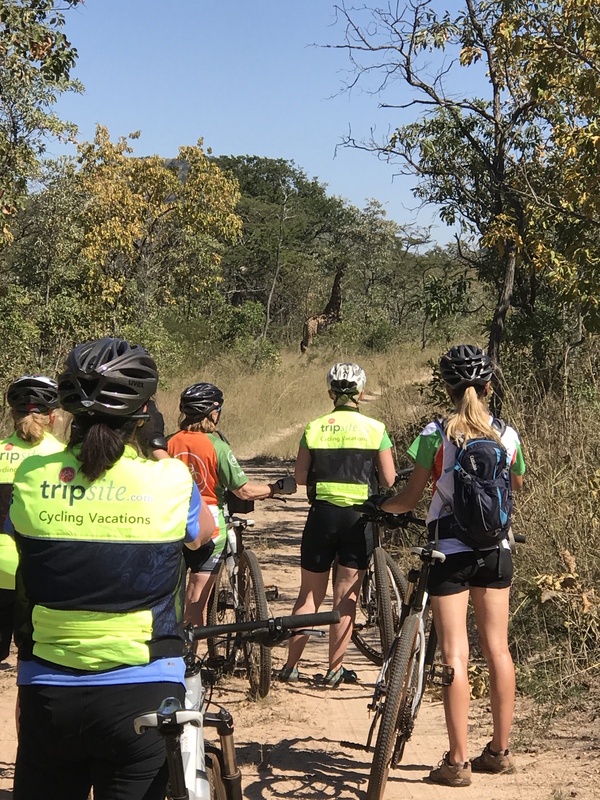 The aim with this safari cycle is to have personal encounters with some of the animals of the African Bush. The Lodge has a wide variety of non-dangerous animals including Giraffe, Impala, Zebra, Kudu, and many bird species. Learn more about the lifestyle and habits of the different species as well as the tracking of animals. An optional afternoon activity includes a bushwalk or alternately enjoy a relaxed afternoon next to the swimming pool. 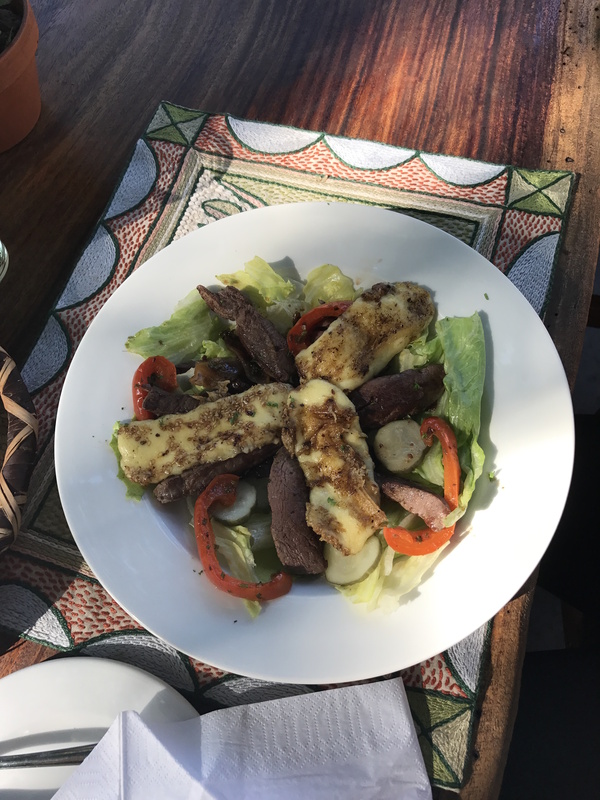 Dinner will be a unique South African experience served in the boma. Day 3 has an early morning start, but is well worth the effort. 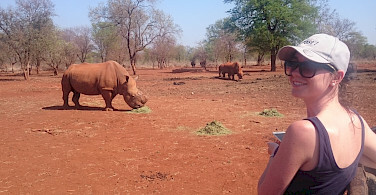 It consists of a visit to Mapungubwe National Park and is without a doubt one of the highlights of the tour. 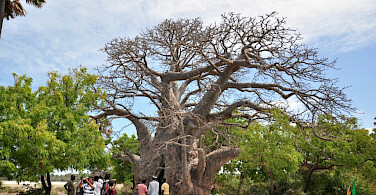 The ancient land of Baobabs is one of the most significant historical landmarks in Southern Africa. What was once known as the center of the largest kingdom in the subcontinent, where a highly sophisticated people traded gold and ivory with China, India and Egypt, rests a magical place open for discovery. 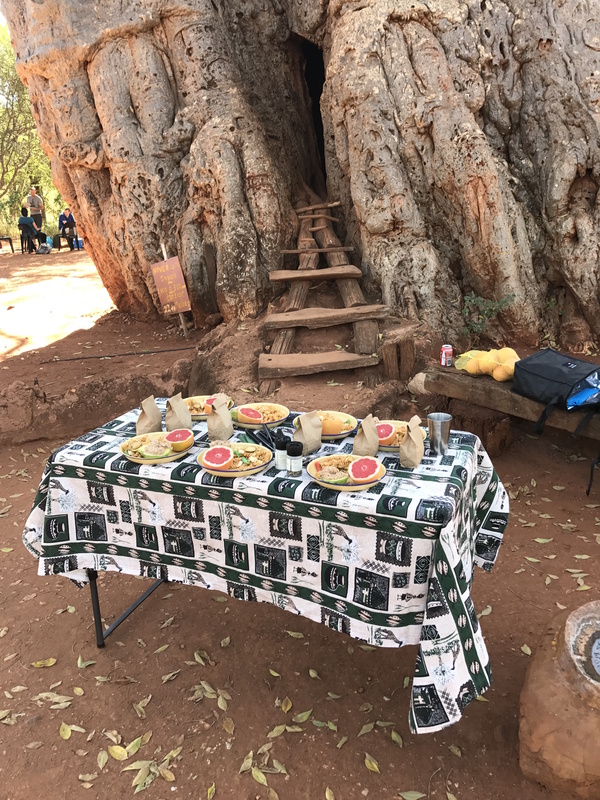 Partake in a hike up the Mapungubwe Hill and learn more about the fascinating history of the ancient kingdom of Mapungubwe. Apart from the incredible history, Mapungubwe is also home to some of the iconic wildlife of Southern Africa and it is a member of SANParks, like the Kruger National Park. 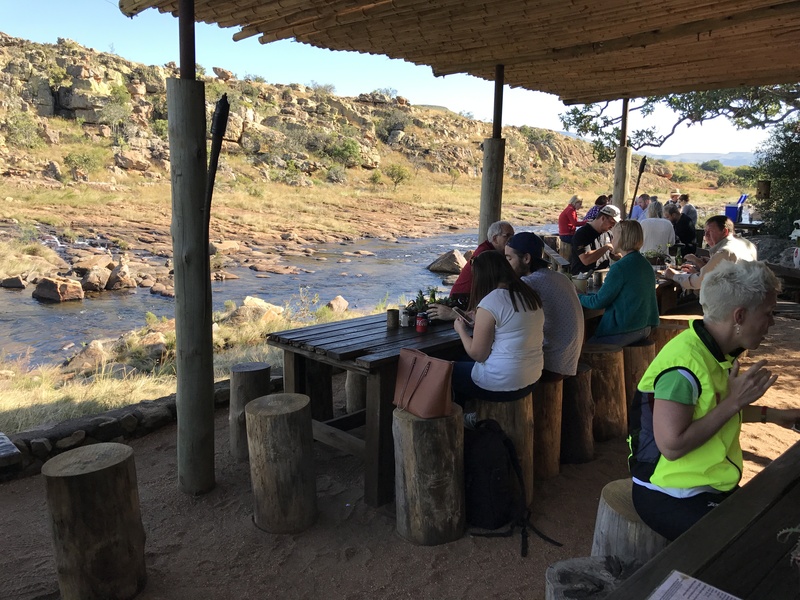 A special moment in this tour is taking in the breathtaking view of the confluence of the Limpopo and Sashe rivers, separating South Africa, Botswana, and Zimbabwe. After breakfast, you will depart to your next location which is the majestic Wolkberg Mountain range of Limpopo. 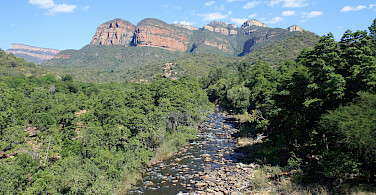 The Wolkberg mountains separate the highveld from the lowveld of Limpopo. 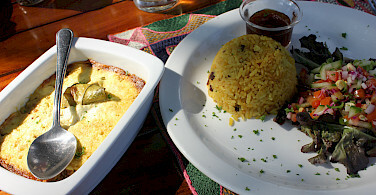 It also contains some of the most intensive and well established Avocado and Macadamia Nut farms in South Africa. 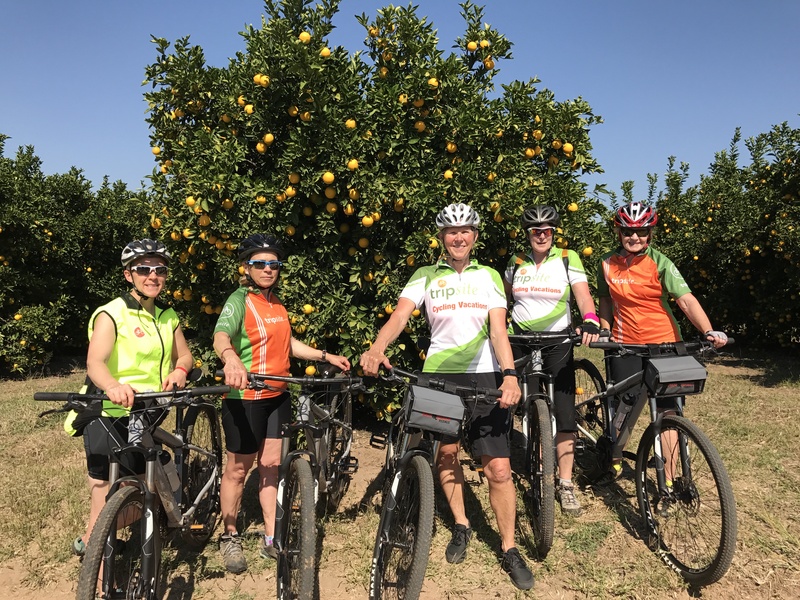 The bike route for the day is a circular one that passes through Pine and Eucalyptus plantations with splendid views of the surrounding mountains and farms. 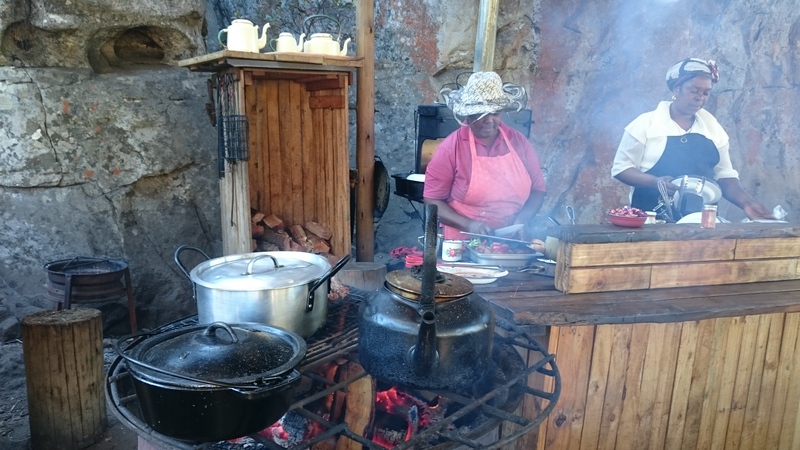 Lunch will take place at a local restaurant with picturesque views of the Letsitele valley, our next location. A relaxing afternoon awaits our guests at the Coach House Hotel. The Hotel has a Spa that offers optional massage and Spa treatments. Drinks can be enjoyed in the historical bar and lounge and guests can enjoy the breathtaking views of the Wolkberg mountains from the comfort of their balconies or next to the pool. Your next location is the Letsitele Valley and the small subtropical farming town of Letsitele. Letsitele is well-known for the vast amounts of citrus fruits produced and exported. 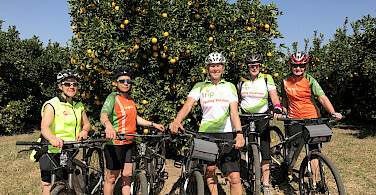 The morning’s ride will take you through orange tree groves with a stop along along the way to visit a citrus packhouse to learn about the workings of a citrus farm, from the planting and farming phase, ending with the packing and export of the fruit. From the packhouse you continue along the canal to the Kaross embroidery. Kaross was started by Irma van Rooyen to create opportunities for rural women to make a living through their embroidery skills. 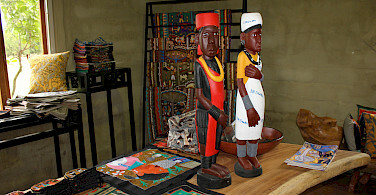 Indulge yourself in the beauty of the embroidery followed by a typical South African lunch. The evening will be spent in the African bushveld. 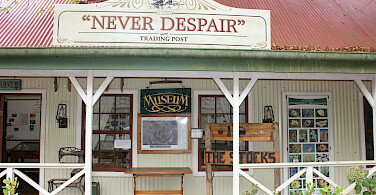 *Depending on the time of year, we may visit a citrus packhouse. 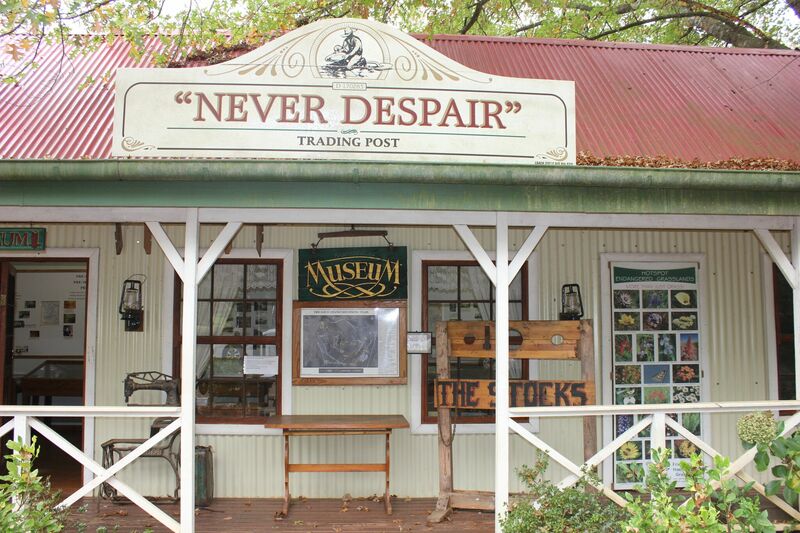 Alternately you may visit an avocado/ macadamia nut packhouse. 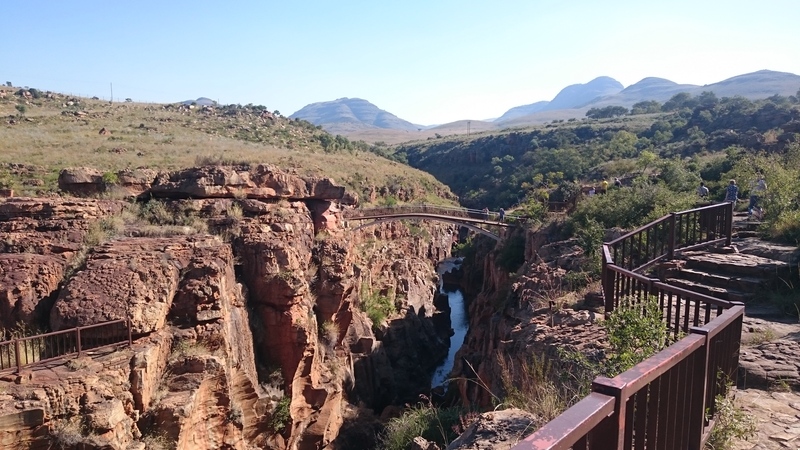 Your bike ride follows the Blyde River through the canyon to a spectacular viewpoint of the Blyde Dam. 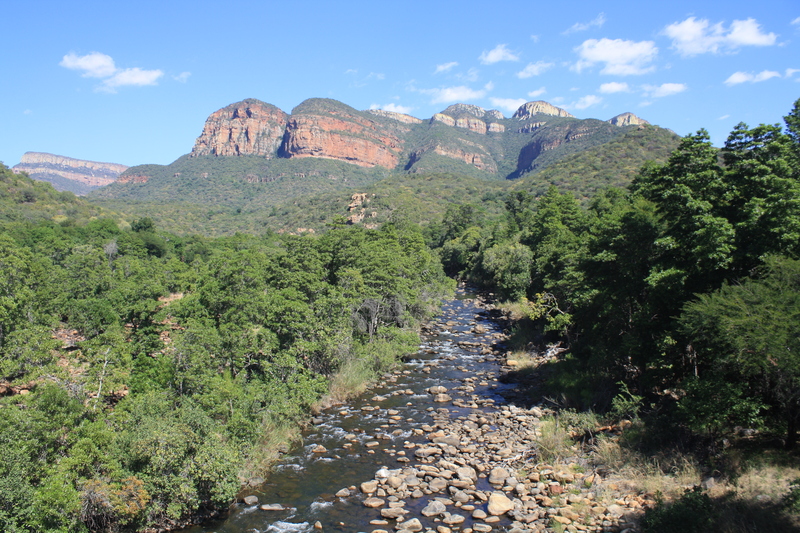 The Blyde River rises on the western slopes of the Drakensberg near Sabie in Mpumalanga and flows northwards past the town of Pilgrim's Rest for more than 100 km, through a region of extraordinary beauty along the eastern escarpment and into the Blyde Dam which was completed in 1974. Along the way be on the lookout for kudus and baboons. 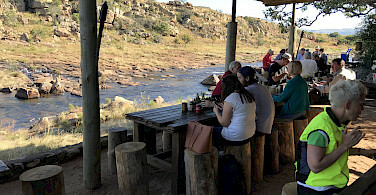 Lunch will take place on the banks of the Blyde River after which you will depart for the Kruger National Park. 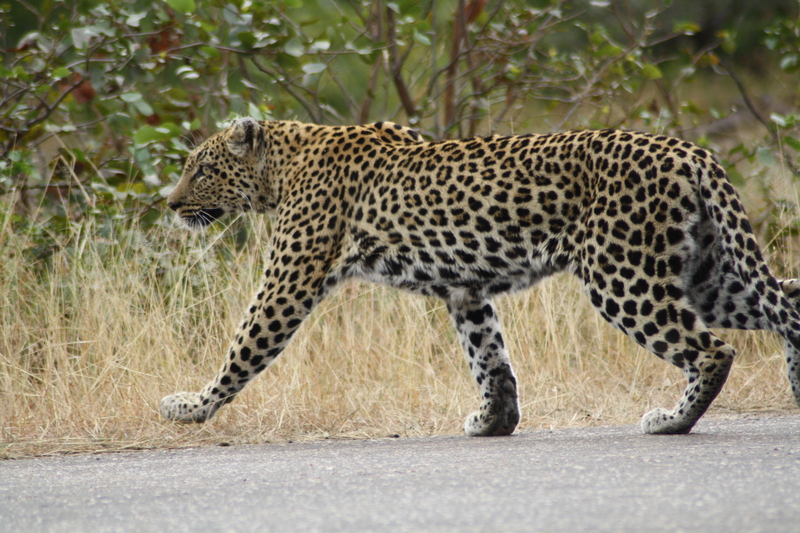 In the late afternoon, explore Kruger on a drive. 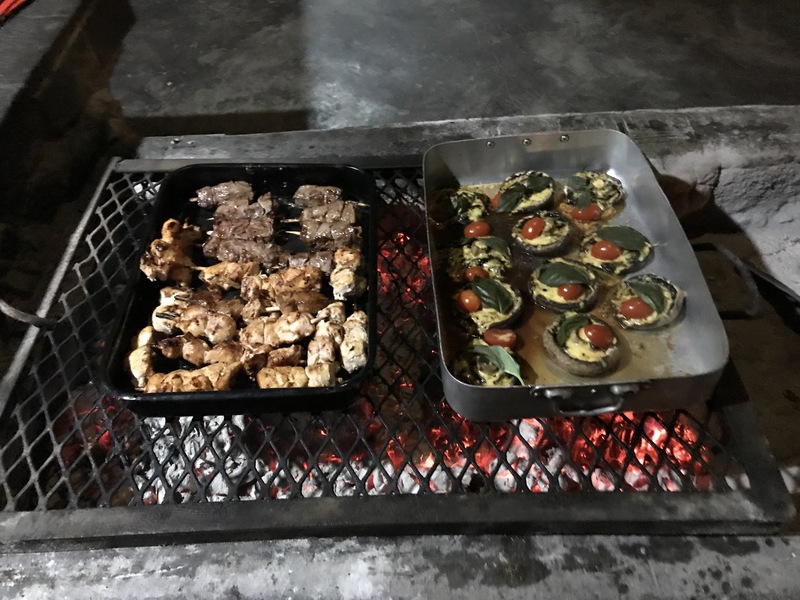 Enjoy your first evening in Kruger with a “braai”. Today is your big Kruger Safari day. 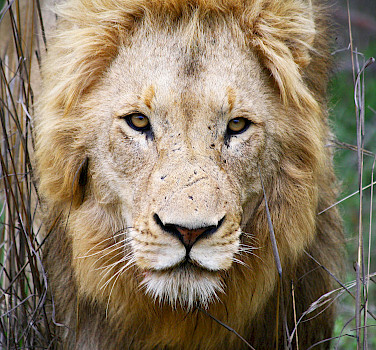 Although Kruger is renowned for the Big 5, it has so much more to offer. Get your cameras ready to capture the special moments in one of Africa’s largest national parks covering an area of 19,485 square kilometres. This wildlife sanctuary is like no other, its atmosphere so unique which will allow you to experience the true heartbeat of Africa. 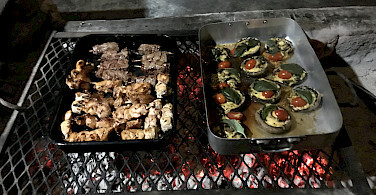 After your day in the Kruger National Park, we will be treated with a delicious dinner. Take time to share stories and photos of your special day in the African bush. 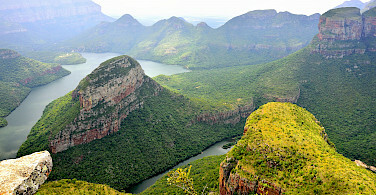 Welcome to the Blyde River Canyon, the third largest and greenest canyon in the world. 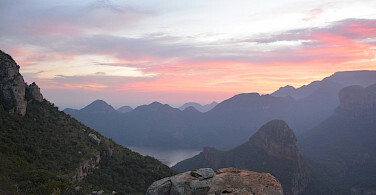 Your bike ride starts at the Pinnacle Rock where your bikes will be made ready whilst you savour the magnificent view. The route follows the escarpment all the way to Wonder View, which is said, on a clear day it is possible to see all the way to Mozambique. The next stop for the day is the Lisbon Falls which is the highest waterfall in Mpumalanga. 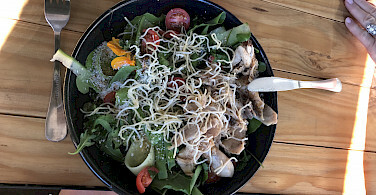 Extend your bike ride by cycling to your lunch spot or hop into the bus for a relaxed drive to lunch, after which youk will visit the Bourke’s Luck Potholes. 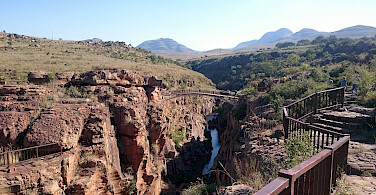 The potholes were formed over centuries of water flowing from the Treur and Blyde River. From here it is a short drive to the famous Three Rondavels lookout point and onto our overnight stay overlooking this escarpment. 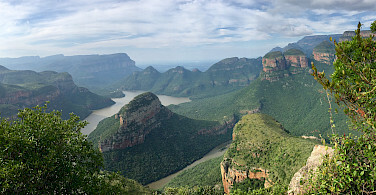 Take in a last look at the striking panorama of the Three Rondavels before we get onto our bicycles. Our route, which is mostly downhill, is surrounded by citrus farms. The Echo Caves marks the end of our cycling. This underground wonderland was stumbled upon by a local farmer in 1923, whilst looking for his lost cow. We will visit the cave before driving along the Abel Erasmus Pass and entering the Lowveld for our last evening. The adventure begins with a late afternoon game drive in an open game viewer with an experienced guide. Dinner will be served in a boma around a fire with sounds of the African night in the background. 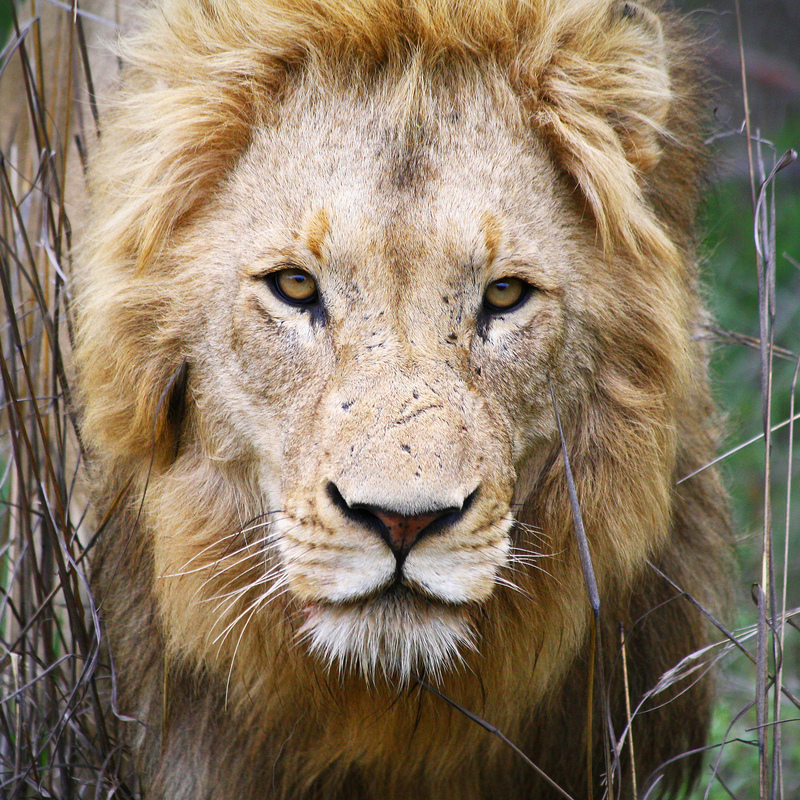 Your final day starts with a bushwalk accompanied by an experienced game ranger through Big 5 territory. 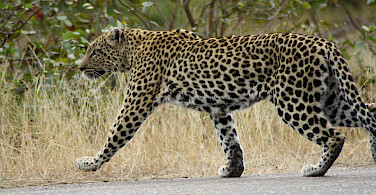 Experience the bush as never before with the chance of a cheetah encounter on foot. After the bushwalk, enjoy a leisurely breakfast whilst saying farewell to your cycling companions. This will be the end of our time together. Return to your home country via the Eastgate Airport in Hoedspruit or a transfer to Johannesburg. Advice on your return journey or an extended stay is available on request. Pre or Post Extension to Victoria Falls is possible. Please ask. This tour is run by Panorama Pedals. Riding with a local guide has so many advantageous. We were taken to places that we wouldn't have seen if we organized this by ourselves. 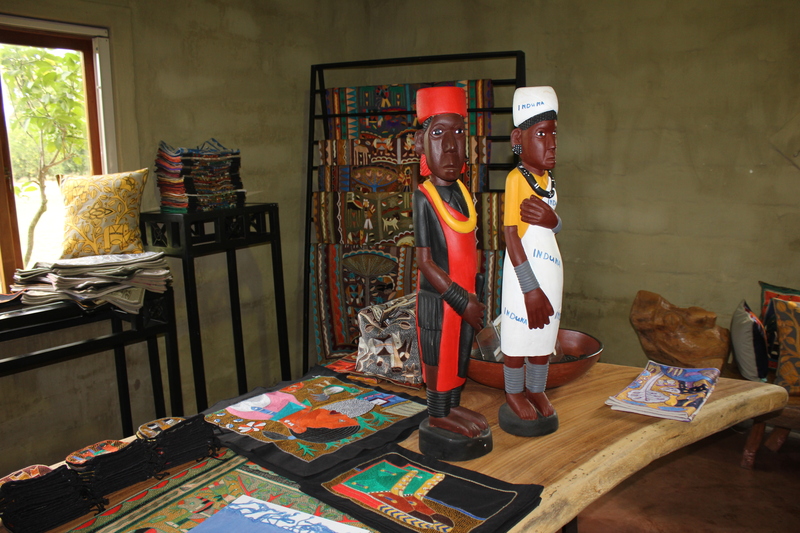 We learnt so much about the country and its culture through our experienced and knowledgeable guides; and we always felt safe. The scenery was amazing. The organization of the food, accommodation and bike routes was outstanding. The highlight was riding our bikes right next to giraffes, hippos and baboons. The last night we were able to pat a cheetah and watched a bob cat join us for breakfast. I will never forget this trip. it had everything plus more. Every aspect of this trip was superb! 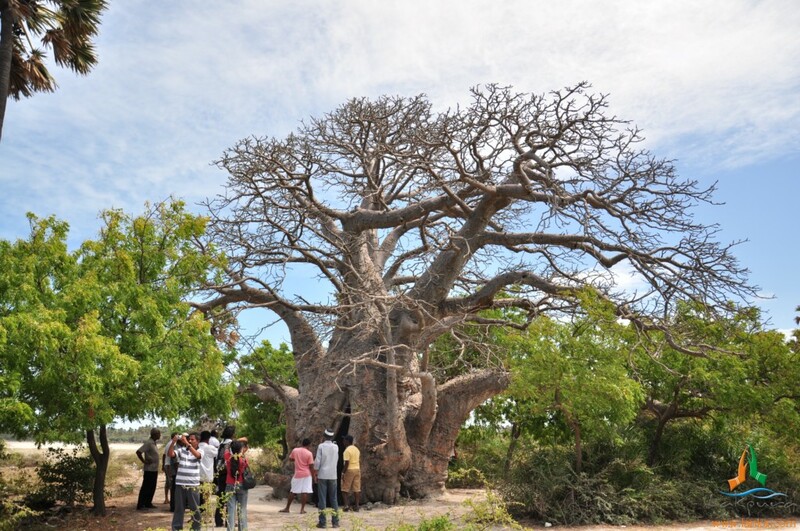 The attentive and experienced guides, the beautiful country, the amazing wildlife, the accommodations, the food. There is not a single thing that could have been improved. Every day contained a variety of new and delightful adventures and we were constantly in awe of the things that we saw and did. It was definitely the trip of a lifetime! 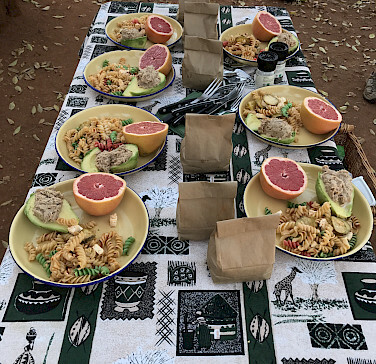 Our South Africa bicycle and safari tour was a trip of a lifetime. This tour was a unique experience. Our guide was a local who shared "her South Africa" with us. 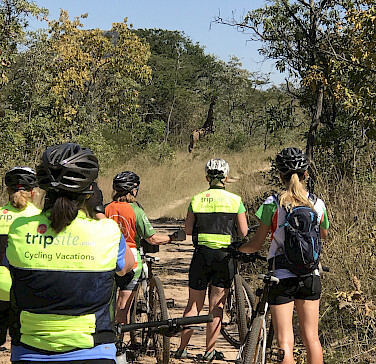 We cycled private game parks with giraffes, kudos, zebras and much, much more. We even got to pet a cheetah. 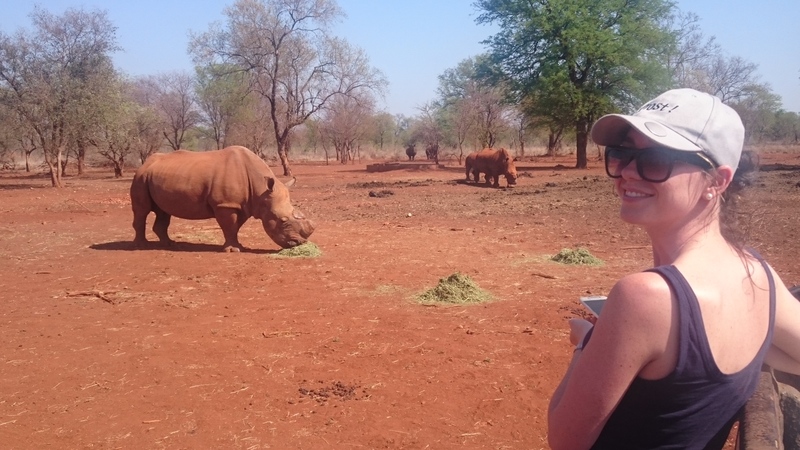 We saw most of the big five on our game drive in Kruger as well as many species of birds, impala, wild dogs, wart hogs, and much more. I will never forget watching the elephants crossing the road right in front of us. 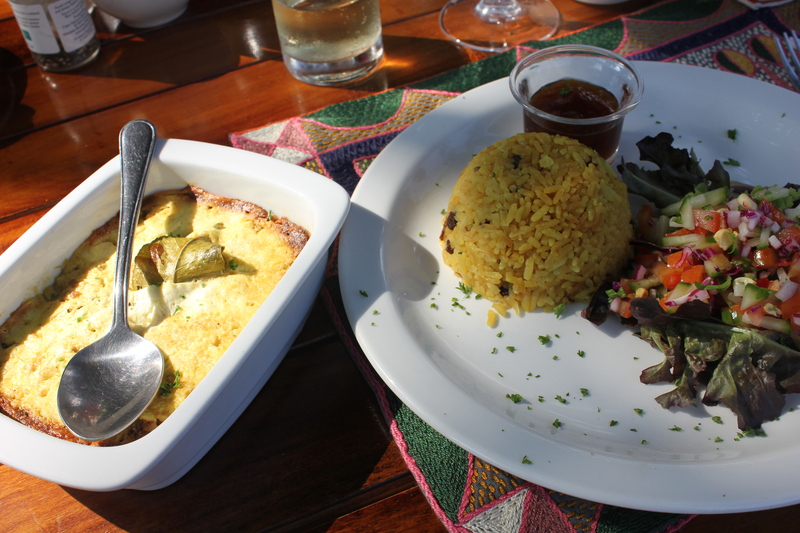 We cycled by spectacular scenery, stayed in excellent accommodations and enjoyed great food. We were very glad that we brought binoculars with us. 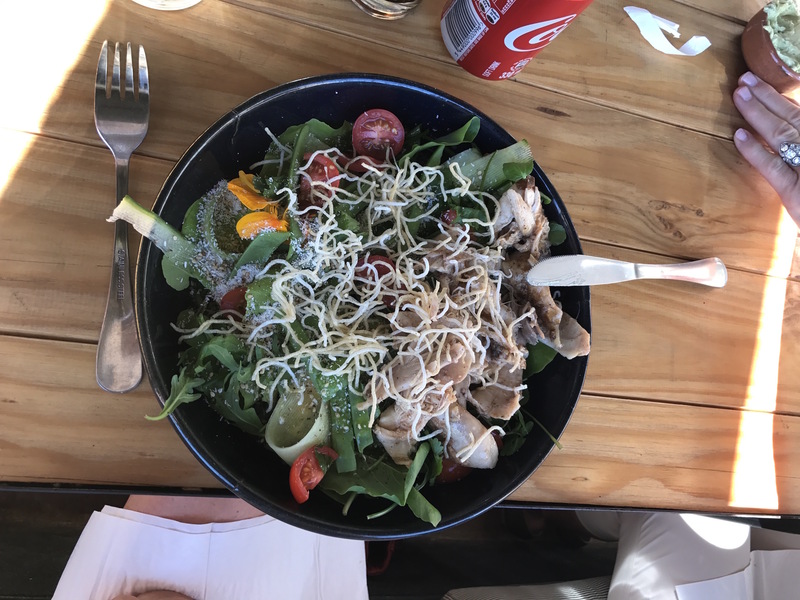 It will be difficult to surpass our trip to South Africa. Biking on dirt roads while viewing wild life was amazing. Our entire group agreed that this was the trip of a lifetime! However, I spent the entire plane ride home plotting how I could take the exact same trip again. We spent the entire tour with AMAZING guides who led us through their "home" and provided us with the opportunity to enjoy sunny South Africa as the local do. The biking on this trip is all done on mountain bikes. The terrain and rides vary, and we added miles onto the routes on a few of the days. The guides allow your group to set the bike pace, and there is always the van to tour in if riding isn't an option. However, our entire group loved all of the biking. My personal favorite was all of giraffes we saw on our bikes. It is amazing way to see the sights! This trip is a great balance of touring and biking, and if you are even considering going, you must go. You, too, will leave plotting a way to get back again. Enjoy sunny South Africa! Petting a cheetah & having breakfast with her were most memorable. Guides were outstanding. They were full of information & happy to share their knowledge & experience with everyone. 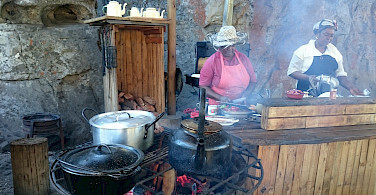 We received a genuine glimpse into rural South Africa.